NAVTTC Jobs 2019, National Vocational & Technical Training Commission (NAVTTC) job for following position through CTS. How To Apply in NAVTTC? 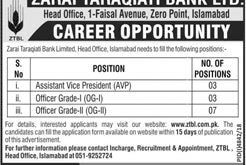 Download CTS application form and deposit slip from CTS website at www.cts.org.pk– For complete instructions, please see the job advertisement given below.